The church stands on gently rising ground apart from the village cottages. Built c.1120, it is in the Trans. Norman style, and consists of nave,chancel (with apsidal termination), south porch and small wooden belfrey at the west end of the roof. There are two bells of unknown date, but obviously ancient, and of remarkable shape, each deminishing rapidly towards the crown, where the diameter is unusually contracted, The clappers are also peculiar, being made in the form of clubs, but without any special enlargement at the striking ends. The chancel measures 18ft 2 in. by 16ft 3 in, and has a perceptible inclination to the south-east, the direction being towards the point in the horizon where the sun rises on St. Nicholas' day (6 December), a compromise on strict orientation, with a mystic significance of which there are other examples in England. The walls are 2 ft 8 in. in thickness, and are mainly composed of pudding-stone, with an a mixture of rubble, The total length inside is only 43 feet. On the north curve of the apse one of the original round-headed windows remains; but elsewhere they have been altered into thirteenth-century lancets, in common with the masonry of the doors. The entrance is by the south door, which is protected by a porch, an ingenious structure of woodwork, set up in 1553, on the strength of a bequest by Thomas Roberts for that and other purposes. His parents are commemorated in a fine brass, let into the chancel pavement, displaying the effigies of William Roberts, his two wives, and five daughters, with a Latin inscription in Gothic characters (1508). The family held the estate for several generations from 1480, the last resident member being Thomas Roberts (d. 1680) whose plain tombstone may be seen just outside the chancel gate. 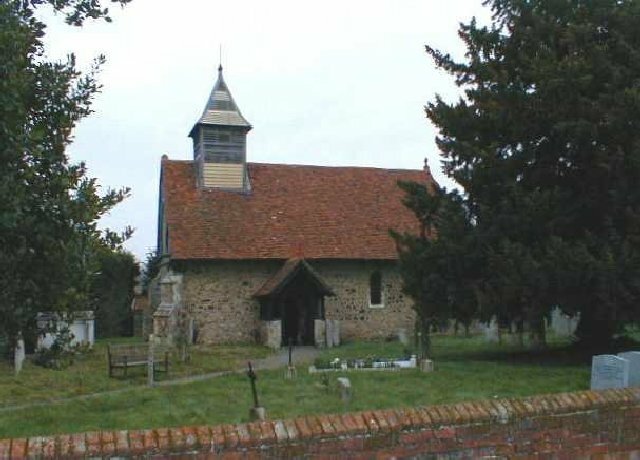 After his death, the property was sold to the Ayletts, also benefactors of the church, who probably gave the Communion vessels in 1689. During the seventeenth and eighteenth centuries, the fabric suffered much from innovation and neglect, but was thoroughly cleaned and strengthened in 1856. The painting (largely allegorical) on the walls and the stained windows date from 1881, when the Rev. Ernest Geldort was appointed to the rectory, and devoted himself, as an artist as well as a clergyman to the decoration of the interior. The north aisle and vestry were added in 1884. There is a fairly complete list of rectors from c.1350. Registers from 1730. 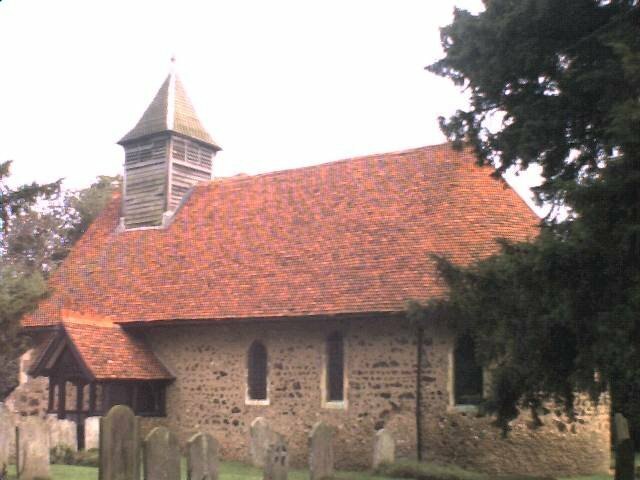 (See Buckler's "Essex Churches" (1856) and Geldart's "Story of the Parish Church" (1886)).